Theresa Rebeck’s boulevard dramedy Bernhardt/Hamlet is set in Paris at the end of the 19th century, and stars the lithe and charismatic Janet McTeer as the world-famous Sarah Bernhardt—the Divine Sarah, celebrated thespian and self-dramatizing celebrity, as renowned for her wild personal life as for her florid performances onstage. In her mid-50s, Bernhardt has decided to grab at the brass ring of the greatest role in dramatic literature: the melancholy and very talky Hamlet, prince of Denmark, king of indecision. While some of Bernhardt’s contemporaries are skeptical at the idea of a woman in the role—one critic dismisses her gambit as “this absurd whim of an aging actress”—McTeer’s performance renders such carping moot; the show offers tantalizing hints of how good McTeer might be in a fully realized production of Shakespeare’s tragedy. Perhaps Rebeck is afraid that Bernhardt’s take on Hamlet would look dated or worse to a modern audience. 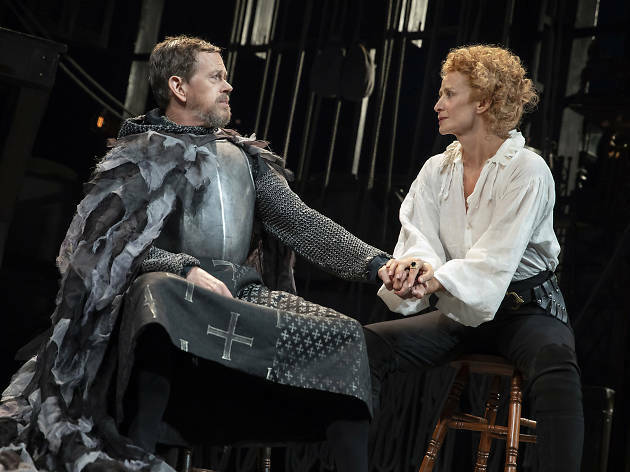 In its stead, the play brings a different ham to the slaughter in a long digression into Edmond Rostand’s Cyrano de Bergerac, a slice of which is depicted in a quaint-looking period production. In Rebeck’s telling, Rostand (Jason Butler Harner) was one of Bernhardt’s many lovers—he spends much of the play struggling to write a prose version of Hamlet that she has asked of him—and they quarrel over the lameness of the central female role in Cyrano. Here as elsewhere in the play, the characters seem like vessels for larger points about artistic creation and women’s access to power. American Airlines Theatre (Broadway). By Theresa Rebeck. Directed by Moritz von Stuelpnagel. With Janet McTeer, Dylan Baker, Jason Butler Harner. Running time: 2hrs 25mins. One intermission. Rostand, brilliant and dashing in life-- appears attired as an accountant (and acts like one as well). please... a scarf, a sequin, ...he could embrace her with one arm and steal her rapier ...step back and tease her as in a Cyrano parody... "Jeune homme..." This is Broadway into the 21st Century! please ...some BRIO ! Yorick could cough a plume of ash and speak, "...Ah,once beautiful Boy, a perfect Prince, we gamboled (..etc.) "NOW BECOME A MAN." We're playing at PLAYING Shakespeare here!